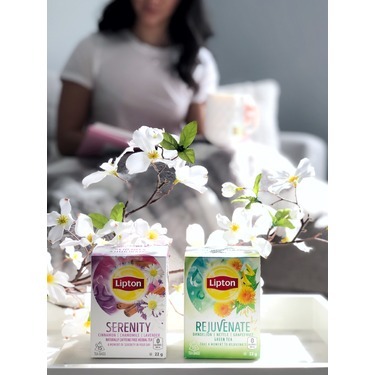 Take a moment to relax, rewind, then press play again with Lipton® Serenity Herbal Tea containing cinnamon, chamomile, and lavender. 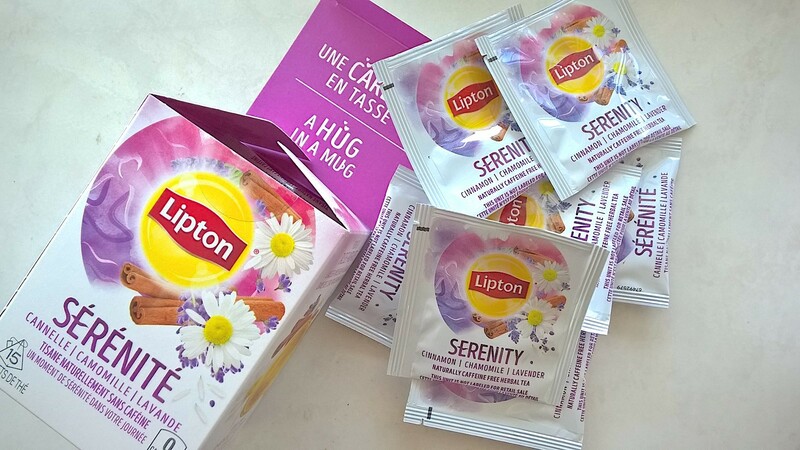 Serenity is a comforting, cozy herbal infusion and naturally caffeine free. 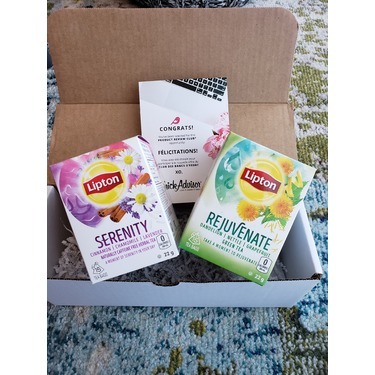 Prenez un moment pour relaxer, décrocher et vous remonter le moral avec la tisane Lipton® Sérénité qui contient de la cannelle, de la camomille et de la lavande. 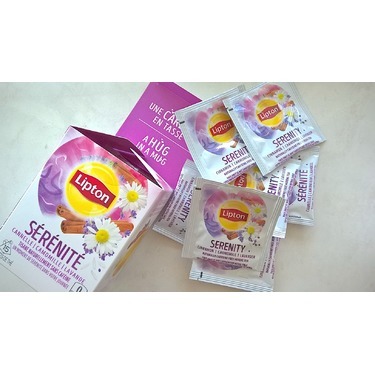 Sérénité est une infusion agréable et réconfortante avec les ingrédients naturellement sans caffeine. 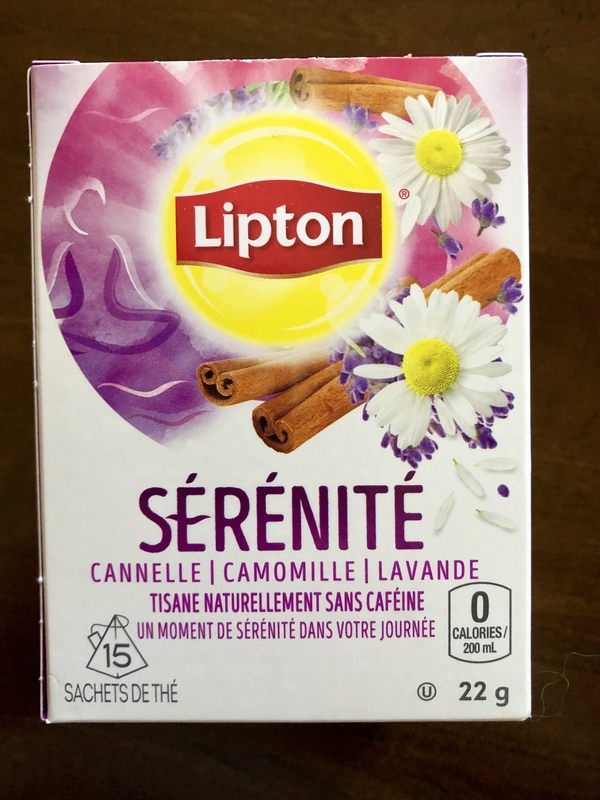 I’m not really a fan of the cinnamon chamomile and lavender blend of this tea but the first time I tried it was at the end of a long week and I felt super relaxed but not groggy. I was able to fall asleep much faster and have a great night’s sleep. I recommend adding honey to counter the taste of chamomile and lavender but if you like those notes then it’s best to drink it hot and not as steeped. 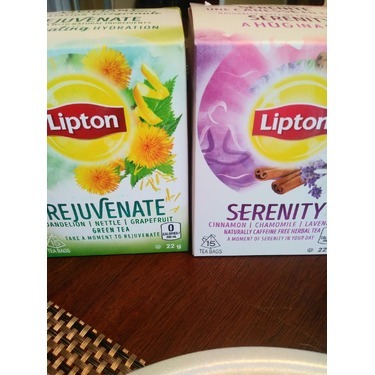 Even if I didn’t like the flavours that much I will still repurchase because of the way it helped me relax and rest. 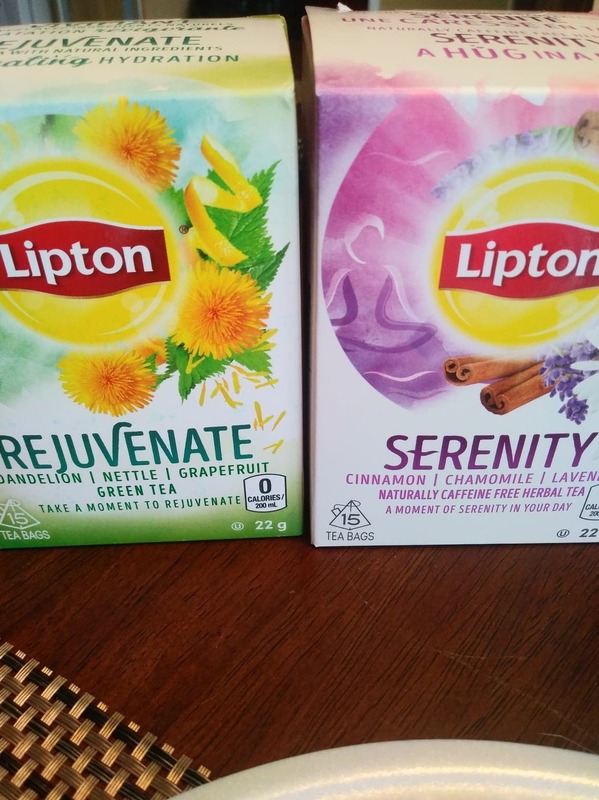 After having this Serenity tea that tastes soooo good ( if you ever wanted to taste lavender bubble bath, this is your chance ) , I fell asleep! I suffer from insomnia so this will definitely be my go to tea when I can’t fall asleep or feel too stressed to go to bed! 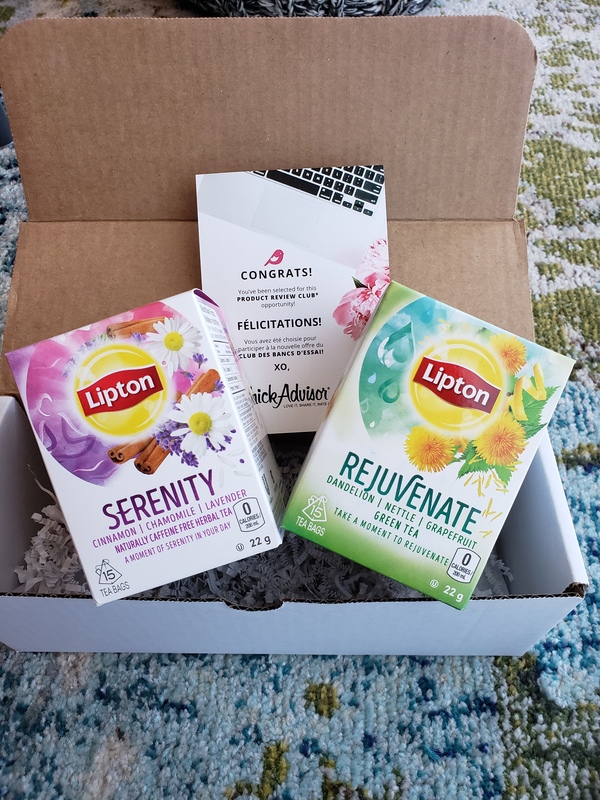 Thanks Lipton! 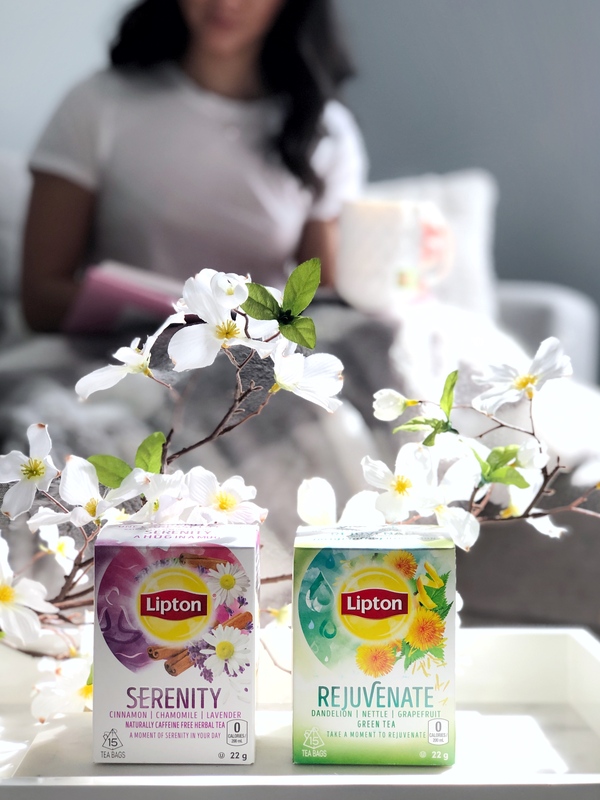 This delectable tea truly tastes like calmness in a mug! It really struck me that basil and rosehips can be tasted as well as the chamomile and lavender.. they all blend together to create a concoction that soothes both body and soul the second it touches your lips.. truly a divine treat. I thought this was ok. I didn't dislike it, but I don't love it. I did think it lived up to its name serenity as I did feel peaceful and calm as I enjoyed it. 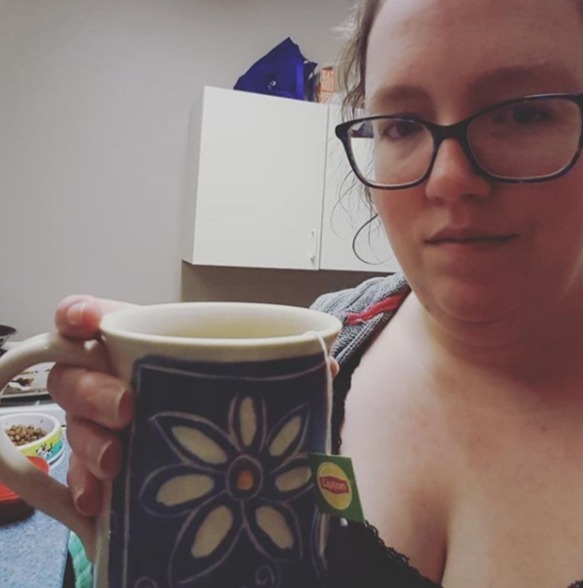 I normally enjoy Vanilla sleepytime tea in the evenings. 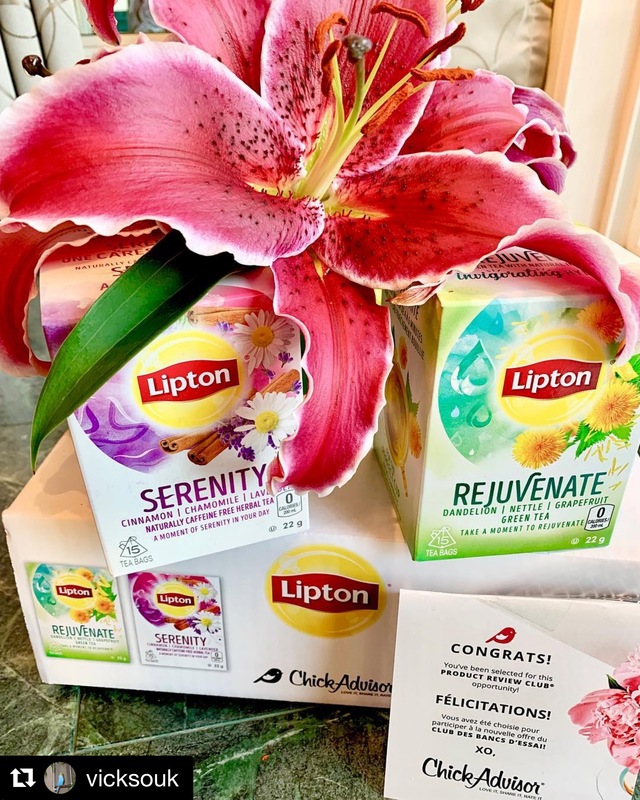 I may share some of these teas with my family and friends since I still prefer my sleepytime tea. 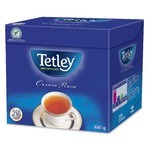 If you smell the steeped tea, it gives mostly a spiced lavender scent which reminded me of mulling spices in the fall. 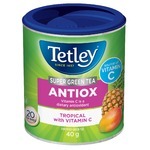 It is also caffeine free which is good for those that drink tea before bedtime as it's less disruptive for going to sleep. The flavour is more of a spiced camomile, which I can see a lot of people enjoying. I am sadly not a cinnamon fan if it is a top note in tea. 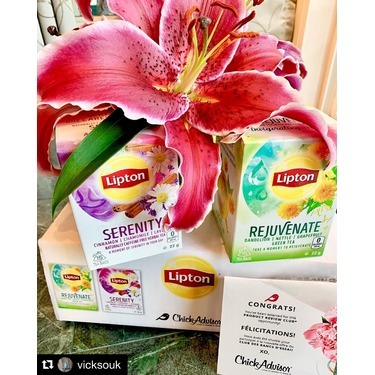 Quality was amazing and the same as the Rejuvenate Tea but I just wasn't into this one. I was surprisingly happy with this tea. Typically, I am not a fan of any tea that has Camomile in it, but this one was different. 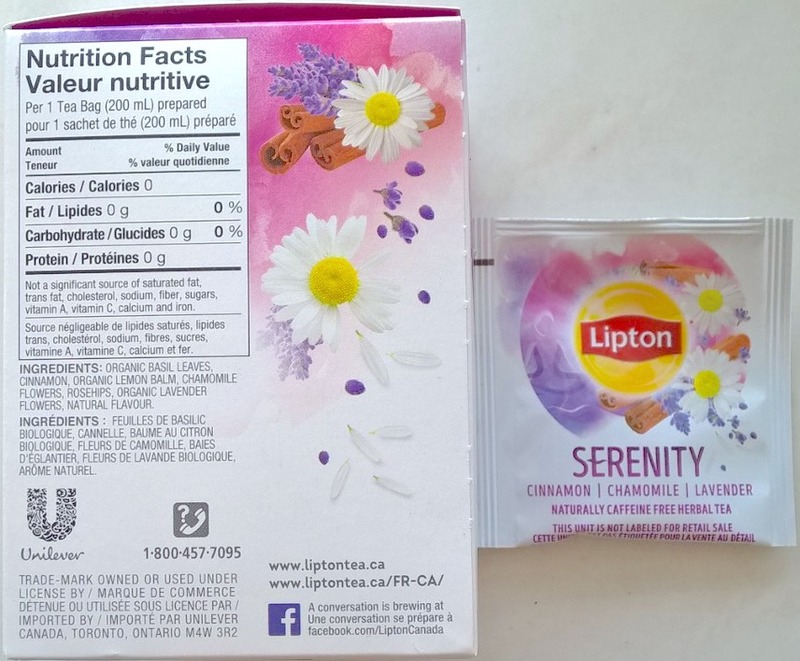 The flavour was a lot more subtle than most camomile teas I have tried, and it really helped me sleep! 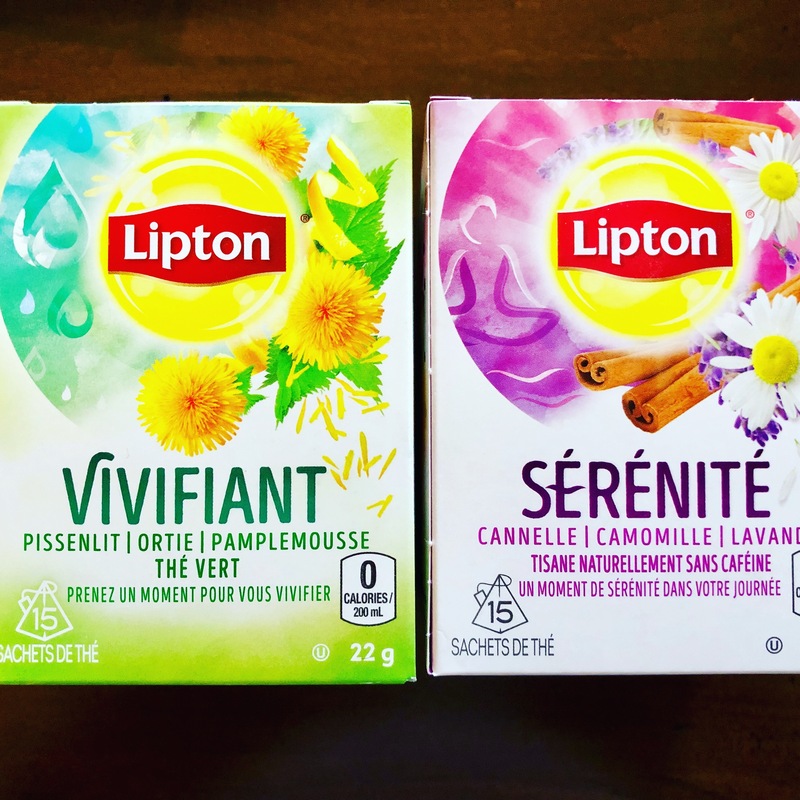 Would definitely recomend, even to people who don't typically like camomile teas. I really enjoyed this tea! 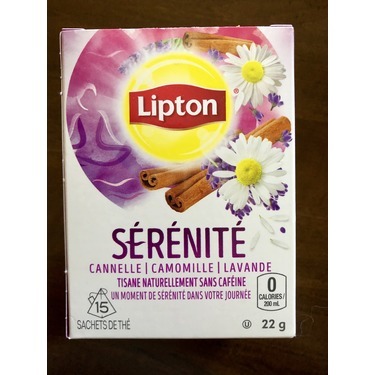 I love how you can taste the cinnamon, lavender and chamomile but it's not overpowering. 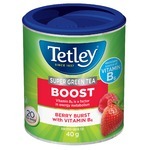 I would recommend this tea. How can't you when the box is so beautiful? Je n'aime vraiment pas les thés fruités, je trouve que ça ne va vraiment pas bien ensemble. 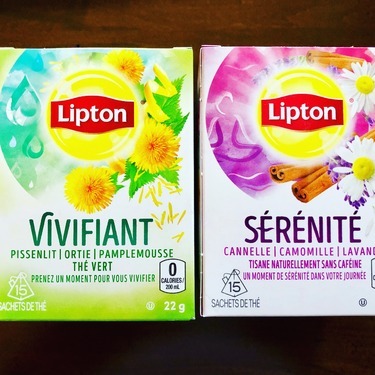 Lipton savent toujours produire des thé d'une bonne qualité et j'imagine que des gens aiment ça. I really love chamomile tea after a long days work. 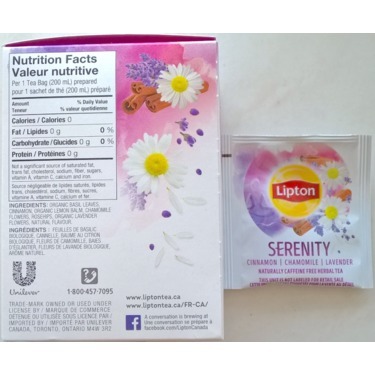 This Lipton Serenity tea has a nice cinnamon flavour combined with the lavender. I do add a little milk and sugar when I make chamomile tea. I dont know why but I find it to be more soothing when it's a little sweet/creamy. 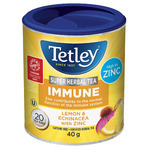 This is a perfect calming tea just before bedtime.